November 23, 2018 / Maria Rabanser / Comments Off on Can fashion be sustainable? Walking around London, we see countless advertisements for fashion retailers every single day. Especially today, on Black Friday, retailers are doing everything they can to convince us to spend more. But our love for fashion may be harming the environment: reports show that fashion is the 2nd most polluting industry in the world. 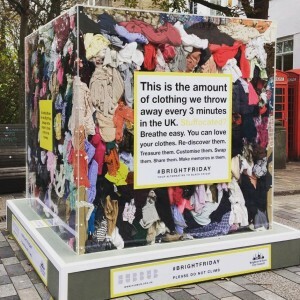 To find out more, the Environmental Audit Committee (EAC), which is a parliamentary select committee made up of MPs from across the political spectrum, launched an inquiry into the Sustainability of the Fashion Industry. Last week, they held a public evidence hearing at the Victoria and Albert Museum, questioning fashion designers, upcyclers and innovators about how to fix the fashion industry’s environmental impact. We were in the audience for the hearing, and are bringing you our highlights of the morning’s discussions. The first thing that became evident was that there is no shortage of challenges to embedding sustainability into fashion. From ‘fast fashion’ being too fast to consider sustainable options to convincing manufacturers to return clothing scraps, fashion brands can face numerous obstacles. The good news is that there are plenty of ideas on how to change this. One interesting challenge is the scraps left over from pattern cutting. Designer Phoebe English told the audience to imagine a t-shirt, and then imagine the piece of fabric it was cut from. While the fabric offcuts used to be a resource and sold, they are now frequently discarded. But innovations are happening. In New York, non-profit organisation FabScrap collects this fabric waste and sells it to makers of all kinds (fashion students, sewists, quilters) at affordable prices. Some brands are also looking into zero-waste pattern cutting, where designs are laid out on the fabric in a way that eliminates cut-offs. The hearing also showed that it’s not just brands who need to change, but also us consumers. The expert panel explained that even though clothes are becoming cheaper, we are spending more, as fast fashion leads us to buy larger quantities of increasingly disposable clothes. But while buying a new outfit may make us happy, the happiness from a new purchase typically wears off after three days. And if an item breaks, we often throw it away – adding to the tonnes of clothes sent to landfill in the UK every year. While some brands now offer free or paid repair services, this isn’t a widespread practice and the panel of experts felt that this was an area legislation could help push the industry in the right direction. One initiative could be making repairs VAT-free. Another idea was for the government to introduce better labelling for our clothes. In supermarkets, food is labelled with health warnings and information on its origin – but our clothes rarely contain warnings about the harmful chemicals they may have been treated with, or the environmental damage they caused. Finally, sustainability in the fashion industry is not only about environmental sustainability. Increasingly, consumers want to know more about the social sustainability of their clothes. While the fashion industry provides employment for millions of women around the globe, the jobs are not up to scratch: pay is often poor, while working conditions are bad. Journalist Lucy Siege and founder of Eco-Age Livia Firth both pointed out that cheap clothes are only possible due to exploitation. In addition, Dr Offord MP explained that in a survey of 51 leading UK brands, 71% could not be sure that modern slavery had not occurred at some point in the supply chain. While the Modern Slavery Act was praised by the panel, many felt it does not go far enough in assigning legal responsibility. Organisations like IndustriALL Union are working to ensure garment workers everywhere in the world have the opportunity to join a union and fight for better working conditions. With all these challenges, what can we as consumers do to make our fashion choices more sustainable? Say no to fast fashion! Try to only buy what you really love and know will wear, and try to buy better quality clothes that you can love for longer. While difficult to do on a student budget, vintage shops, charity shops and resale platforms like Ebay or Depop may help you find some bargains! If you have some clothes you no longer want, why not try going to a clothes swap? You can usually bring clothes you no longer like, and swap them for other pre-loved items a t a clothes swap near you. 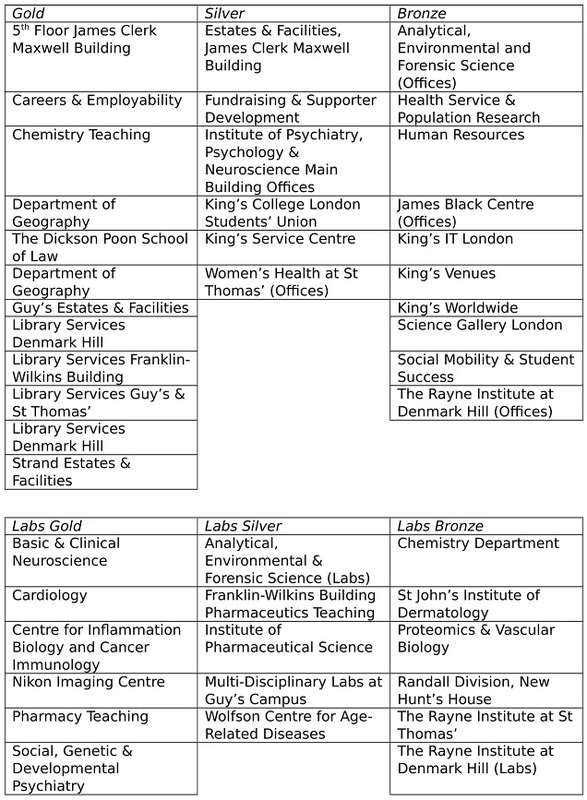 If you live in King’s Residences, keep an eye out for any swaps your fellow students or the Residences Team are organising. There are lots of places where you can now rent an outfit for a special occasion rather than buying it new. If you can, try to repair your clothes instead of throwing them away, or alter them to give them a new look. There are more and more repair cafés popping up around the country, and some brands even offer repairs on their products. During the hearing, the panel pointed out that while terms like ‘organic cotton’ are protected, claims of ‘sustainable cotton’ may not be. As consumers, we can try to find out what is behind these claims to make sure brands are sticking to what they promise. If you are interested in finding out more about the inquiry, all the latest information is available on the Environmental Audit Committee webpages. The next public hearing is taking place on the 27th November, and will include witnesses from various fashion retailers. You can also watch the full footage of this public evidence hearing here. We are happy to say that King’s has officially become an accredited Living Wage Employer. Our commitment to paying our staff members the London Living Wage is an integral part of Vision 2029’s Service Pillar, demonstrating our commitment to society and our staff. While King’s has been paying the London Living Wage since 2014, we have only just been made an accredited Living Wage Employer. 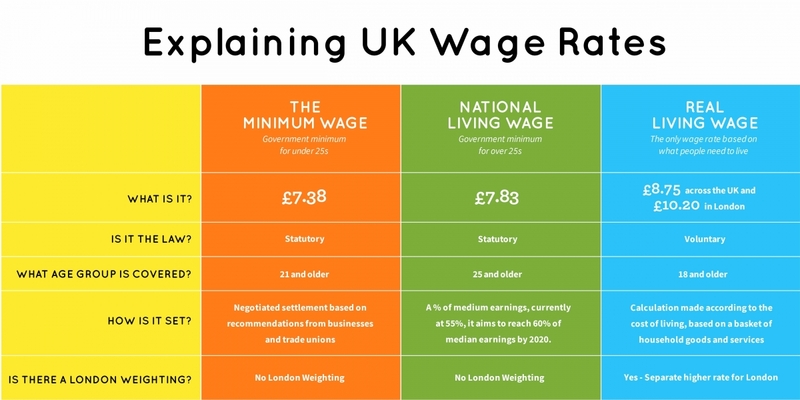 The Living Wage is the only UK wage rate that is based on living costs. While the government introduced its own ‘national living wage’ rate for staff over 25 years of age in April 2016, this was not actually calculated against what employees and their families need to live. The real Living Wage is paid by over 4,400 UK business who believe in ensuring that their employees receive fair pay and can afford to live on that pay. For London there is a separate rate taking into account higher living costs in the capital. What does it mean to be an accredited Living Wage Employer? Being an accredited Living Wage Employer means that King’s is committed to paying the real Living Wage to all our directly employed staff. In addition, King’s ensures that are on-site contractors, such as cleaners, are paid the London Living Wage. King’s is also committed to annual pay increases linked to the cost of living. What does it mean for staff members? We’re happy to say that King’s is committed to ensure that it’s staff members receive a fair, liveable wage. 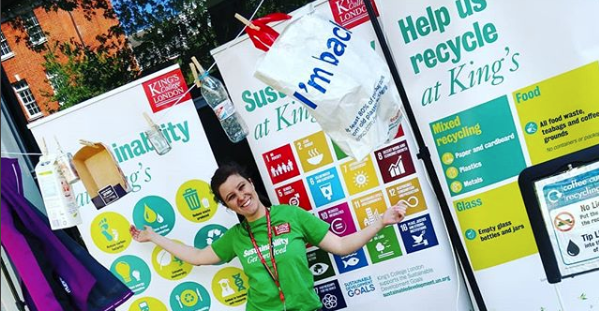 It’s been a busy year and last week on 10 July we had the pleasure of celebrating the achievements of everyone who has been actively involved in sustainability over the past year here at King’s. The annual King’s Sustainability Awards ceremony took place at Bush House and we celebrated the passion and commitment of the 235 Sustainability Champions who have carried out 1,950 sustainability actions, nearly 500 more than the previous year. 45 Sustainability Champion Teams were awarded: 16 Bronze, 11 Silver and 18 Gold Awards. We also celebrated with Special Awards for other staff and students from across the university who have worked to embed sustainability across operations, teaching and the wider King’s community. We welcomed Professor Jonathan Grant, Vice President & Vice Principal (Service) who thanked all involved for being the ones to motivate others and to stand up and make a difference to the environment and our local communities around King’s. ‘Service’ is the term we adopted at King’s in our Strategic Vision 2029 to describe our commitment to society beyond the traditional roles of education and research. Professor Grant shared details of the King’s Service Strategy framework and explained that the Sustainability Champions are an integral part of the framework. The Service Strategy framework will be launched and celebrated on 19 July and all King’s staff and students are welcome to attend. As part of the event we celebrated our students who’ve been involved with a video showcasing their actions over the past year which includes working with King’s Food as Sustainable Food Assistants, auditing our Sustainability Champions teams, taking part in Student Switch Off actions and competitions in King’s Residences, working as Sustainable Food Assistants and running social enterprises such as Zest and Fetch Ur Veg- who offer weekly organic veg box deliveries. We saved a surprise for Awards day and our Library Sustainability Champions teams found out that they had been nominated as finalists at the national EAUC Green Gown Awards, recognising the impact that they have had by making the libraries more sustainable for both staff and students. This year we now have 3 finalists at the Green Gown Awards, including Widening Participation’s Parent Power project and King’s Food for their work on ditching disposables. If you would like to find out more about becoming a Sustainability Champion contact the Sustainability Team at sustainability@kcl.ac.uk. So far King’s has saved over £140,978 since we launched Warp It in 2016 and we’re giving you prizes to help to make that number even bigger! We’re giving you prizes to share as many items as possible on Warp It. The user who uploads the most items by the 12 July 2018 will win a goodie bag of vegan treats! What exactly is Warp It? Warp It is a Freecycle style online platform that allows staff members from inside King’s to share unwanted furniture, office and lab equipment they no longer need. Every time an item is added to Warp It it is then available for staff members across King’s to claim, meaning that unwanted, good quality items are no longer being thrown away. Lab equipment can be put on to Warp It as well! Everything from electronic equipment to glassware can be shared and claimed on the platform. Warp It not only helps us to reduce the amount of waste that we produce, but it also saves users a large amount of time and money that they would otherwise have spent on purchasing new items. 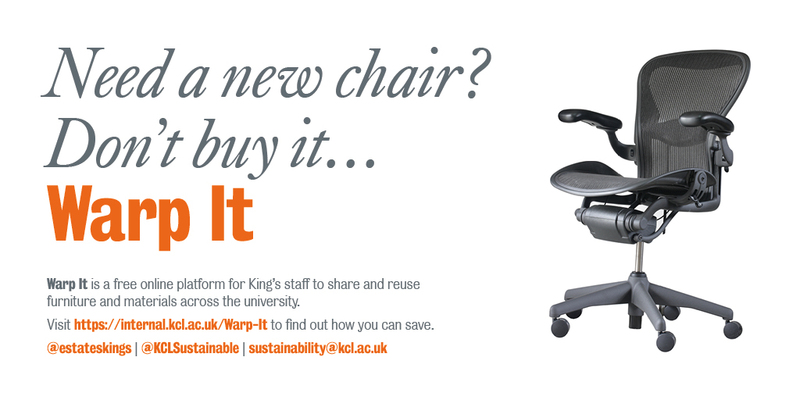 It helps to promote the ethos of reuse, reduce, recycle at King’s and encourages staff members to think about what they purchase, before they purchase it. Sign up to Warp It and start winning prizes today! Over the last couple of months, the Sustainability Team has been out and about visiting our campuses with an ecologist from the London Wildlife Trust. This forms part of our work on developing a Biodiversity Strategy for King’s, which will launch in the next few months. On our visits, we looked at the current state of biodiversity at our campuses, and at the ways in which we can improve it to make spaces more attractive for students, staff, and of course wildlife. As part of this, we also visited the King’s sportsgrounds. King’s has three sportsgrounds across South London: New Malden near Berrylands, Honor Oak Park near Brockley, and The Griffin in Dulwich. While sportsgrounds are not traditionally associated with biodiversity due to the need for pitches to be kept in optimal condition for the many sports clubs using them, the King’s Sport team has successfully made space for wildlife. At Honor Oak Park, biodiversity has even been integrated into the newly built pavilion, which has a green roof. Particularly New Malden, which is situated next to the Hogsmill River and the Elmbridge Meadows Local Nature Reserve, has seen many biodiversity improvements over the years. The edges of the ground bordering the nature reserve are left untouched, creating a buffer zone between the reserve and the managed sports pitches. The vegetation of various trees and shrubs provides a valuable habitat for birds and small mammals. In addition to this, nesting boxes for various species have been installed across the grounds. Hidden just under the roof of the pavilion are bat boxes, which provide important roosting and resting space for bats struggling to find space in cities. Small bird boxes are scattered across the trees around the edge of the sportsground, and a nesting box and shelf for owls have been installed inside a shed. 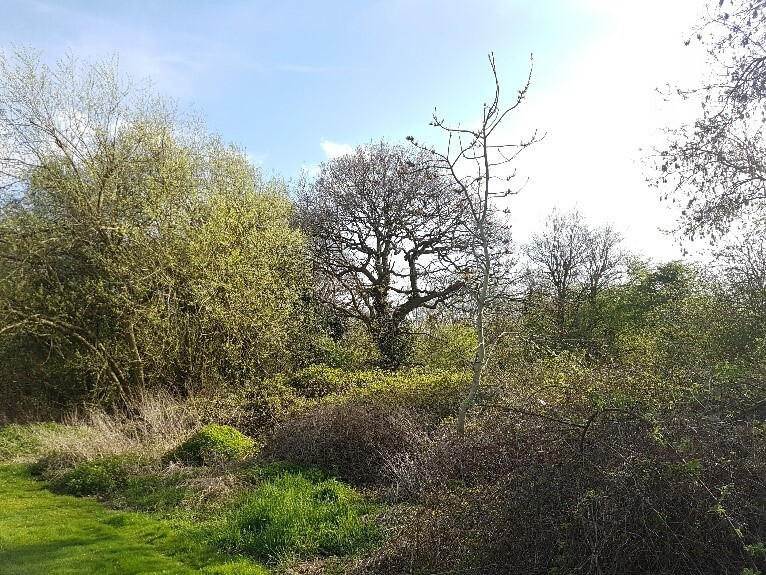 While biodiversity features can often be seen as nice ‘extras’, the team at New Malden have recognised that biodiversity can also be an opportunity to directly improve the grounds. For example, instead of replacing netting on a fence, the team has planted a hedge made up of a range of native species. This can provide food for pollinators, space for wildlife once grown, looks attractive to those using the grounds, and is likely to be longer-lasting than netting. Once our Biodiversity Strategy has been published, we will share it across the university, ask what students and staff would like to see, and work with campus teams to implement it. If you want to read about our plans once we publish our strategy, make sure to follow this blog, our Twitter, or are signed up to our monthly newsletter. Well, what a week. We in the Sustainability Team had a raucous time shouting about waste as part of our Reduce Waste Week. Our aim was to reach out to the idle public and hit them with games, workshops and community events to engage, shock, and enlighten them to the growing waste problem and the need to REDUCE the amount we create in our everyday lives. Waste is a choice and not a given so we armed ourselves with facts, ideas and a giant raspberry costume and delved headfirst into the King’s community. Our first event was a workshop on making your own toiletries. 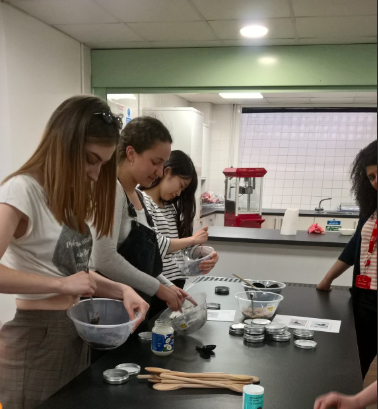 This DIY Lush event was fabulous with Sophia concocting a dreamy coconut and coffee grounds face scrub and a pure peppermint and bicarb toothpaste. All made with natural ingredients and in re-usable pots so we can say goodbye to Colgate and toothpaste tubes! Our second event was the incredible Disco Soup. What is a Disco Soup you might ask? Well, we make soup – to Disco music! 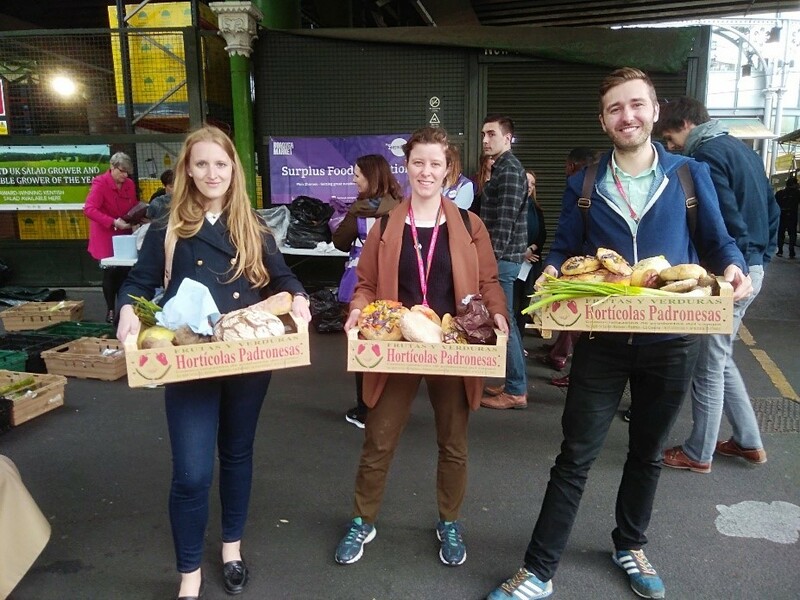 We hooked up with Plan Zheroes to scour Borough Market for food that was going to be thrown away by street vendors and collect it for donation. We then scurried back to set up shop in The Shed and had student volunteers prepare the veg while the marvellous SU chef cooked up a carrot soup, mushroom soup and coleslaw. We also manage to get our hands on two bins bags of artisan bread which usually sells at £4 a pop! It’s incredible the amount of food is thrown away – 25% of all farmed food is thrown away!! 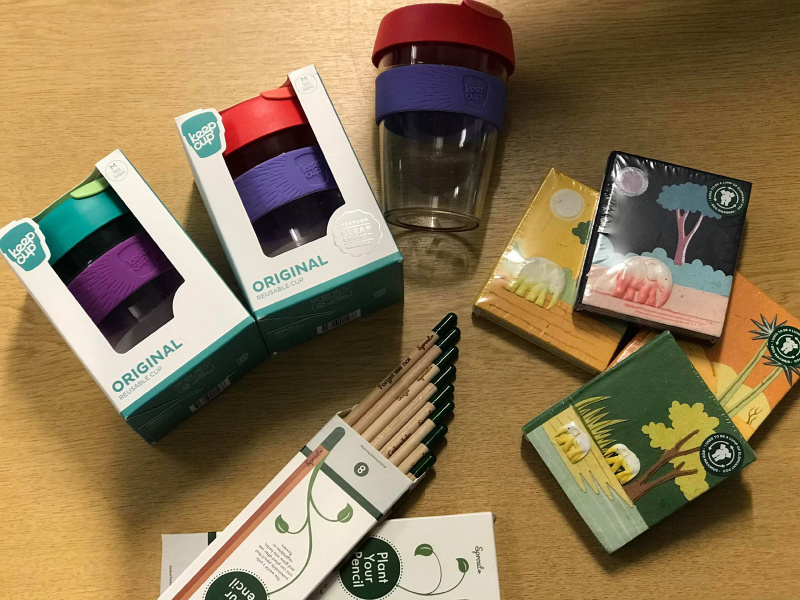 Interspersed with these events we had pop-ups where we highlighted the issue of single-use items and how, if they’re not recycled or re-used, can stay in the environment for hundreds if not millions of years!! 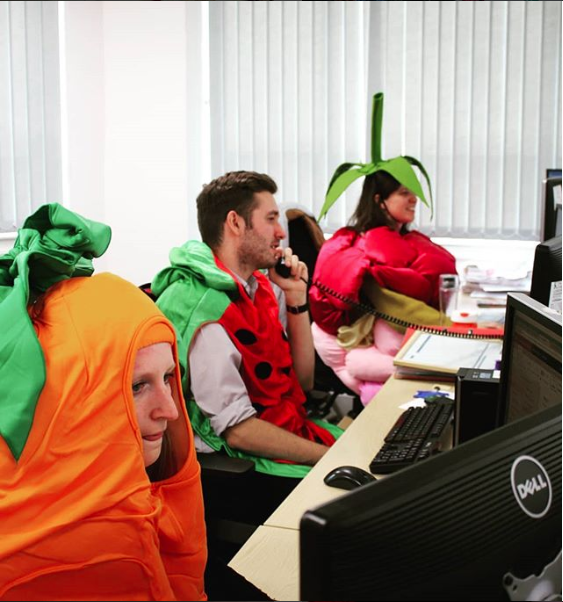 In between all of this we were dressing up as fruit and pratting around, having a good time raising awareness about waste and how the only real way to solve the waste problem is to not create it in the first place. Are you interested in helping to promote sustainable food at King’s, as well as gaining experience at running a unique enterprise? 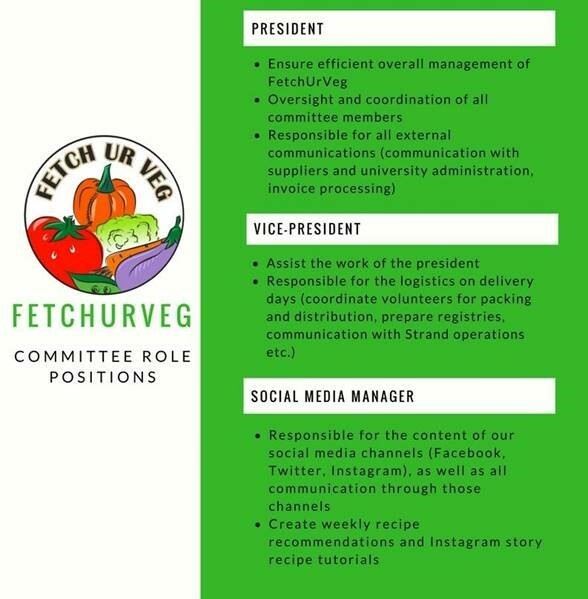 Fetch Ur Veg is a student-led food co-op, providing fresh, organic vegetable bags to students and they are currently looking for new committee members to take over from next year. As a committee member you will have the opportunity to gain practical experience on how small enterprises are run, as well as encouraging healthy, sustainable lifestyles to students on campus. If you’re interested in any of the following roles please apply online.